If a tooth is fractured it will need repairing with some type of filling material. The same applies if the tooth is decayed. A filling must be placed after the removal of a decayed tooth in order to fill in the hole and to stop further decay from starting. A filling will also serve to protect the nerve of the tooth. Composite (white) fillings are widely used because of their favourable aesthetic appearance over the traditional silver amalgam fillings. These are made of plastic resin and filler, with the filling shade able to be closely matched to the colour of the patient's teeth. There are many types of filling materials available, depending on what is needed in each situation. The dentist will discuss with you the type of filling required before your treatment. 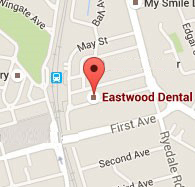 At Eastwood Dental, rest assure that we use the best and the safest materials available for our patients.